Jarred Amato can relate to high school students who don’t spend a lot of time reading for pleasure. It wasn’t so long ago that it was his own high school story: too busy with homework, sports, and extracurriculars to get lost in a good book. But the Metro Nashville Public Schools English teacher knows well that the distractions separating many of his students from reading—the internet, video games, 250-channel cable packages, to name just a few—are even greater today. For those living in “book deserts” with little or no access to books or libraries, the gulf is far greater and made worse by a culture that rarely celebrates reading or readers, especially in low-income communities. One result: a national K-12 literacy crisis. Just 37 percent of fourth-grade students scored at or above the proficient level in reading on the 2017 National Assessment of Educational Progress (NAEP). Among eighth-grade students, the figure was 36 percent. Twelfth graders fared no better: 37 percent performed at or above proficient in 2015, the most recent year that NAEP assessed high school seniors in reading. The use of more inclusive, representative books that feature a diversity of races, religions, cultures, and linguistics is essential to schools’ efforts to get more kids reading, says Carol Jago, the associate director of the California Reading & Literature Project at the University of California, Los Angeles. When Amato moved from middle school to Nashville’s Maplewood High School three years ago, he was eager to change the dynamic around literacy in his classroom and turn more students into passionate, proficient, lifelong readers and writers. Together with his students, he devised a game plan: infuse the classroom with high-quality, high-interest, culturally relevant young adult novels; provide “space and time” in class for independent reading and book talks about their reading; and create student-led book clubs, open to students as well as family members, school staff, and community members. The goal was to create a culture of reading and “bring people together around reading,” Amato says. Among the first titles his then-sophomore class devoured: The Crossover, the Newbery Medal-winner about basketball-playing twins by Kwame Alexander; March, the autobiographical graphic novel about the civil rights movement by Congressman John Lewis; and Ghost, the coming-of-age story by National Book Award finalist Jason Reynolds. Focusing solely on the “traditional whole class novel” wasn’t exciting his students, wasn’t reflecting their own experiences, and wasn’t leaving them clamoring for another book, Amato says. But adding in books written by and about people of color, centered on characters and settings that his students knew about, cared about, or were curious about—that made the difference. Amato is not alone in his mission to help students develop their “reading identities” by broadening the lens on authors, storylines, and characters. In addition to other Nashville elementary, middle, and high schools that have replicated the Maplewood initiative, educators from nearly 600 schools across the country have joined the grassroots literacy effort known as the Project LIT Community. Many engage in the online community (@ProjectLITComm), sharing classroom and book club ideas and literacy success stories. Like Julia Torres, a Denver Public Schools teacher-librarian, they often write grants to fund the purchase of books that are given free to students, lead community outreach efforts, schedule author visits, hold Skype sessions, and lead field trips connected to the books, such as a screening of the film version of The Hate U Give. This effort has proved to be “a big piece in helping students re-establish their love for reading,” says Torres, who sponsors the Project LIT chapter at the Montbello High School campus. Acknowledging the importance of and need for more representative books is not new. As far back as 1965, Nancy Larrick, a founder and president of the International Reading Association, condemned the lack of diversity in children’s literature in her now famous article “The All-White World of Children’s Books” published in the Saturday Review. More recently, the nonprofit group We Need Diverse Books was formed in 2014 to address “the lack of diverse, non-majority narratives in children’s literature.” The organization works with book publishers to create more children’s and young adult books about and by people from marginalized backgrounds, including people of color, people with disabilities, LGBT individuals, and religious minorities. For nearly three decades, Nebraska’s Lincoln Public Schools has worked to “systematically seek out the newest and best titles by and about diverse cultures and people” and promote them throughout the district via its annual MOSAIC Multicultural Book Collection display. Created in response to a 1991 Nebraska Department of Education rule that required schools to include in their libraries “current and unbiased” information about different cultures, MOSAIC was designed to help curriculum specialists identify high-quality literature that they could infuse into their curriculum areas, says Joy Harvey, coordinator of library services for the 42,000-student district. “People don’t necessarily think of Lincoln as a diverse community, but we are. And that diversity has only continued to grow, so it’s important to provide access to the best titles for all our students,” says Harvey, who leads the 15-person MOSAIC curation effort. While MOSAIC had initially consisted of a traveling display of selected books, it recently added an interactive, online display that includes author interview videos and book trailers, reviews, and teaching resources to compliment many of the 190 titles selected. 15 percent said they find it “very difficult” or “difficult” to find appropriate titles to round out a diverse library collection. They cited finding portrayals of “characters with disabilities, Native or Indigenous peoples, and English language learners” as the most difficult. 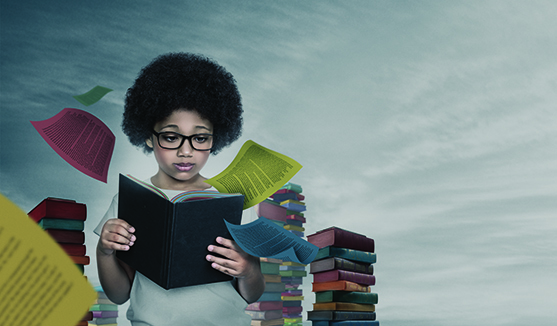 Nearly 70 percent of respondents reported purchasing more children’s and young adult titles with diverse characters in the last year. The best of these books reflect lives “that are being lived by countless Americans, and if we’re not attending to the complexity of those lives through the stories we put in front of kids, then essentially we’re saying those lives don’t matter as much as lives that are more recognizable and mainstream,” says Jennifer Buehler, associate professor of English education at Saint Louis University and author of Teaching Reading with YA Literature: Complex Texts, Complex Lives. In her seminal essay “Mirrors, Windows, and Sliding Glass Doors,” published in 1990, African-American children’s literature scholar Rudine Sims Bishop described the importance of children’s literature in three ways: As mirrors that allow children to identify with a character and see reflections of themselves; as windows offering views of worlds that may be real or imagined; and as sliding glass doors that allow students to walk back and forth between someone else’s experience and their own and think more critically about the whole of it as a result. That message was echoed during the Mirrors of Me: Children Seeing Themselves in Their Literature Conference that Kalamazoo Public School sponsored in August 2017 in conjunction with the Michigan Department of Education, the Michigan Association of School Boards, the Michigan Association of School Administrators, and others. The conference also explored the power of multicultural literature in the development of grade-level reading among students. If schools put an emphasis on “quantity, quality, and diversity of literature,” students can become more engaged with the literature, says Kalamazoo Superintendent Michael Rice. “The more engaged they are, the more substantially they will read, and as a result they are going to be better served by schools and teaching,” he says. In November 2018, the 13,000-student district launched an initiative that will add new diverse reading choices to classroom book collections in each of its elementary and middle school classrooms over the next year. Some teachers were already doing “great things with diverse literature,” but that was not the case across the board, Rice says. Often, teachers were faced with spending their own money to buy the books or collections identified by the district on the diverse reading lists it compiled. It was clear “we needed to figure out how to really infuse this, weave this effort into the fabric of the district. Students of color account for just 25 percent of the enrollment in Ohio’s Olentangy Local School District, but the increasingly diverse 21,000-student district just north of Columbus also is emphasizing the importance of more inclusive, representative literature in the education of all of its students, says Jackie Merkle, supervisor of equity and inclusion. “Knowing that we are going to be sending our students off into a global society, a global workforce, it’s never too early to start showing students positive depictions of people of all diverse backgrounds and building skills around respect, empathy, cultural competency, and how to work across differences,” Merkle says. How educators teach canonical texts, whose voice is and isn’t being heard in the English curriculum, along with issues around equity and bias in books and media are common topics in the social media chats led by the grassroots group #DisruptTexts. The educational objectives of English Language Arts through Advanced Placement are “transferable to a variety of texts,” says Torres, among the group’s leaders. She suggests thinking beyond the “fierce grip” that certain texts hold and “this defense of them because those are texts that we read when we were in school.” Expanding the field of view can get to the same goal “if not more because the student will actually enjoy the reading and find it culturally relevant,” Torres says. For Tricia Ebarvia, another #DisruptTexts leader who teaches English at Conestoga High School, in Berwyn, Pennsylvania, working with a contemporary eye means no more Catcher in the Rye and making room for more “traditionally non-dominant voices” within the curriculum, not just as part of the classroom library intended for independent reading. She now teaches a “book circle unit” in which students select from four novels by contemporary Native Indigenous authors. The unit also includes a section on poetry and short stories that complement the issues in the novels. Michelle Healy (mhealy@nsba.org) is associate editor of American School board Journal.